IMX first appeared under the banner of Goldstream Mining in 1986. In its early stages, Goldstream was focused on exploration. Seven years later, the company changed its name to IMX Resources. This change was made to signal that the company was ready to take on the next stage of its evolution by developing and operating a mine. IMX is an acronym for investment, mining and exploration. According to John Nitschke, Chairman and Acting Managing Director of IMX Resources, that transition is one of the things that set his company apart. “We are one of the rare Australian exploration companies that has actually become a producer,” he says. 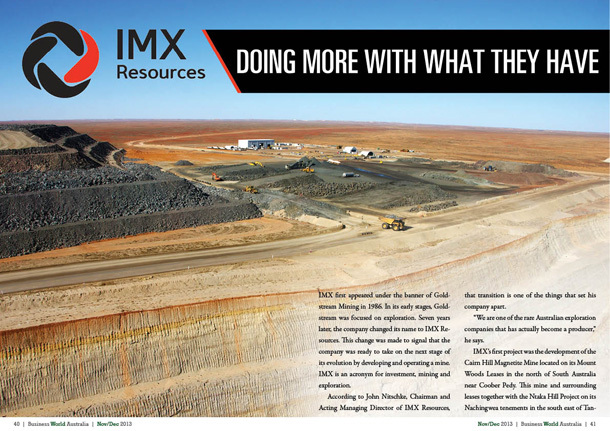 IMX’s first project was the development of the Cairn Hill Magnetite Mine located on its Mount Woods Leases in the north of South Australia near Coober Pedy. This mine and surrounding leases together with the Ntaka Hill Project on its Nachingwea tenements in the south east of Tanzania represent the company’s value and growth potential. Nitschke says that the year 2008 was a “real milestone for IMX.” That was when they received all the approvals required to begin construction of the Cairn Hill Mine. This was smack in the middle of the Global Finical Crisis which was a difficult time to begin such an ambitious undertaking. Despite that challenge by 2010 IMX was able to secure a Joint Venture Partner to help fund the project and move ahead with development of the mine. The Joint Venture partner was Taifeng International, an entrepreneurial Chinese company based in Chengdu. Taifeng own 49% of the Cairn Hill Mine and are major shareholder of IMX. 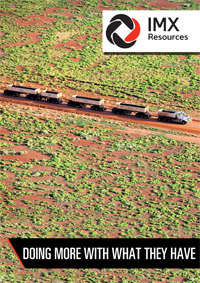 On August 26th, 2010 South Australian Premier Mike Rann officially opened the Cairn Hill mine. By December of that year IMX made its first shipment from the mine, and was officially the first new iron ore exporter in South Australia since the 19th Century. The operational success at Cairn Hill demonstrates IMX’s ability to manage projects all the way from feasibility studies through to production. In addition to the Cairn Hill operation IMX has exploration sites across the globe in Australia and Africa. “We have recently entered into a Joint Venture with MMG on our Nachingwea property in Tanzania that will potentially see them spend $60 million over the next five years. This is the highest value Joint Venture in base metals for many years and gives us strong up side to a fully funded and aggressive exploration program focused on finding high grade nickel mineralisation. This program has got off to an excellent start with a very good intersection of 3.46% nickel over 13.65 metres,” advises Nitschke. The 100% Mt Woods Magnetite Project located 12 kilometres south west of the Cairn Hill operation is another asset that will help lead the company strongly into the future. Nitschke says that IMX has an Inferred Resource of 569 million tons of magnetite at 27 percent iron and an exploration target of 0.9 to 2 billion tons at 18 to 35%. Nitschke summarises that they believe they can come up with a project that will be able to produce 2.5 to 3.5 million tons per annum of magnetite at a capital cost of $300 to 400 million. “We are currently looking for partners to fund the studies necessary to take this exciting magnetite project through to a production decision,” he adds. The Cairn Hill mine is located 50 kilometres south east of Coober Pedy in South Australia, and has over 170 employees throughout the supply chain from the mine to Port Adelaide. Around 20 per cent of the work force is employed locally, which has ensured a strong relationship with the nearby community. IMX not only gives back to the community by providing jobs, but they have also made it a priority to assist the less fortunate. Furthering this goal, IMX has partnered with the Red Cross in order to provide for an initiative known as the ’FOODcents’, which now operates in the Coober Pedy area. ‘FOODcents’ is an educational program aimed at parents that highlights the importance of nutrition and the development of young minds. Here they provide information and ideas that allows families to prepare quality, inexpensive alternatives to fast food. This is not the end of their dedication to the communities in which they operate, but more of a taste of the importance the IMX puts on their ability to add value to the lives that the company touches. IMX Resources has also been recognised by the industry for their achievements in developing a new approach to loading commodities for export. At the Business SA 2013 Export Awards they won in the category for Minerals and Energy (Including Related Services). Nitschke explains that its contractor at Cairn Hill, Exact Mining Services, trucks crushed magnetite ore 65 kilometres from the mine to the Rankin Dam rail siding. There the magnetite is loaded into open top containers provided by Cronos mounted on flat bed rail wagons provided and maintained by Gemco. These are then railed to the port by one of the other service providers SBR. The containers are stacked on a hard stand at the port. When ships arrive the containers are moved to the wharf where they are picked up by conventional container cranes using a special Rotainer attachment that enables the containers be picked up and discharged by being rotated over the hold of the bulk ships. Other service providers to the project include Amdel who provide sampling and assaying and Logicoil who provide fuel. “The Rotainer solution was very innovative at the time and we were the first to use it in this application. It really enabled Cairn Hill to be developed because it eliminated all of the heavy capital expenditure of building a storage shed and bulk handling facilities that would have been necessary at the port otherwise,” explains Nitschke. IMX also sees the environmental advantages to this form of loading, due to the fact that it minimises dust and particulate dispersal into the air. 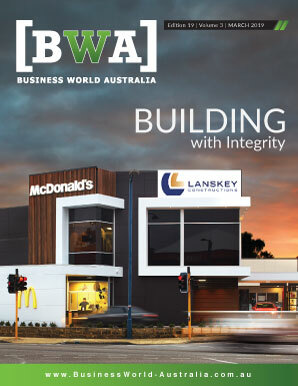 “We have cash flow, quality assets and quality people. Our mission – or focus – is to really do more with what we have, and this goes into the assets we have and what our plans for the future are,” relates Nitschke. “All of this makes us a great partner and an even greater investment opportunity,” he concludes. Beyond the assets they have, IMX has also set a goal to play a leading role in the development of the South Australian iron ore industry. This will be achieved, explains Nitschke, by leveraging the experience they already have.